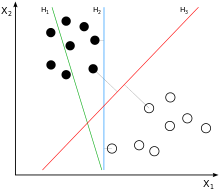 ^ 1.0 1.1 Cortes, C.; Vapnik, V. Support-vector networks. Machine Learning（英语：Machine Learning (journal)）. 1995, 20 (3): 273–297. doi:10.1007/BF00994018. ^ Ben-Hur, Asa, Horn, David, Siegelmann, Hava, and Vapnik, Vladimir; "Support vector clustering" (2001) Journal of Machine Learning Research, 2: 125–137. ^ * Press, William H.; Teukolsky, Saul A.; Vetterling, William T.; Flannery, B. P. Section 16.5. Support Vector Machines. Numerical Recipes: The Art of Scientific Computing 3rd. New York: Cambridge University Press. 2007. ISBN 978-0-521-88068-8. ^ Barghout, Lauren. "Spatial-Taxon Information Granules as Used in Iterative Fuzzy-Decision-Making for Image Segmentation." Granular Computing and Decision-Making. Springer International Publishing, 2015. 285-318. ^ Statnikov, A., Hardin, D., & Aliferis, C. (2006). Using SVM weight-based methods to identify causally relevant and non-causally relevant variables. sign, 1, 4. ^ Boser, B. E.; Guyon, I. M.; Vapnik, V. N. A training algorithm for optimal margin classifiers. Proceedings of the fifth annual workshop on Computational learning theory – COLT '92. 1992: 144. ISBN 089791497X. doi:10.1145/130385.130401. ^ Aizerman, Mark A.; Braverman, Emmanuel M. & Rozonoer, Lev I. Theoretical foundations of the potential function method in pattern recognition learning. Automation and Remote Control. 1964, 25: 821–837. ^ Jin, Chi; Wang, Liwei. Dimensionality dependent PAC-Bayes margin bound. Advances in Neural Information Processing Systems. 2012. ^ Shalev-Shwartz, Shai; Singer, Yoram; Srebro, Nathan; Cotter, Andrew. Pegasos: primal estimated sub-gradient solver for SVM. Mathematical Programming. 2010-10-16, 127 (1): 3–30. ISSN 0025-5610. doi:10.1007/s10107-010-0420-4. ^ Hsieh, Cho-Jui; Chang, Kai-Wei; Lin, Chih-Jen; Keerthi, S. Sathiya; Sundararajan, S. A Dual Coordinate Descent Method for Large-scale Linear SVM. Proceedings of the 25th International Conference on Machine Learning. ICML '08 (New York, NY, USA: ACM). 2008-01-01: 408–415. ISBN 978-1-60558-205-4. doi:10.1145/1390156.1390208. ^ Meyer, D.; Leisch, F.; Hornik, K. The support vector machine under test. Neurocomputing. 2003, 55: 169. doi:10.1016/S0925-2312(03)00431-4. ^ Hsu, Chih-Wei; Chang, Chih-Chung & Lin, Chih-Jen. A Practical Guide to Support Vector Classification (PDF) (Technical report). Department of Computer Science and Information Engineering, National Taiwan University. 2003. ^ Ferris, M. C.; Munson, T. S. Interior-Point Methods for Massive Support Vector Machines. SIAM Journal on Optimization. 2002, 13 (3): 783. doi:10.1137/S1052623400374379. ^ John C. Platt. Sequential Minimal Optimization: A Fast Algorithm for Training Support Vector Machines (PDF). NIPS. 1998. ^ Shai Shalev-Shwartz; Yoram Singer; Nathan Srebro. Pegasos: Primal Estimated sub-GrAdient SOlver for SVM (PDF). ICML. 2007. ^ R.-E. Fan; K.-W. Chang; C.-J. Hsieh; X.-R. Wang; C.-J. Lin. LIBLINEAR: A library for large linear classification. Journal of Machine Learning Research（英语：Journal of Machine Learning Research）. 2008, 9: 1871–1874. ^ Zeyuan Allen Zhu; 等. P-packSVM: Parallel Primal grAdient desCent Kernel SVM (PDF). ICDM. 2009. Kecman, Vojislav; Learning and Soft Computing — Support Vector Machines, Neural Networks, Fuzzy Logic Systems, The MIT Press, Cambridge, MA, 2001. Schölkopf, Bernhard; Burges, Christopher J. C.; and Smola, Alexander J. (editors); Advances in Kernel Methods: Support Vector Learning, MIT Press, Cambridge, MA, 1999. ISBN 0-262-19416-3. Vapnik, Vladimir N.; and Kotz, Samuel; Estimation of Dependences Based on Empirical Data, Springer, 2006. ISBN 0-387-30865-2, 510 pages [this is a reprint of Vapnik's early book describing philosophy behind SVM approach. The 2006 Appendix describes recent development]. Fradkin, Dmitriy; and Muchnik, Ilya; Support Vector Machines for Classification in Abello, J.; and Carmode, G. (Eds); Discrete Methods in Epidemiology, DIMACS Series in Discrete Mathematics and Theoretical Computer Science, volume 70, pp. 13–20, 2006. Succinctly describes theoretical ideas behind SVM. Bennett, Kristin P.; and Campbell, Colin; Support Vector Machines: Hype or Hallelujah?, SIGKDD Explorations, 2, 2, 2000, 1–13. Excellent introduction to SVMs with helpful figures. Ivanciuc, Ovidiu; Applications of Support Vector Machines in Chemistry, in Reviews in Computational Chemistry, Volume 23, 2007, pp. 291–400. Campbell, Colin; and Ying, Yiming; Learning with Support Vector Machines, 2011, Morgan and Claypool. ISBN 978-1-60845-616-1. 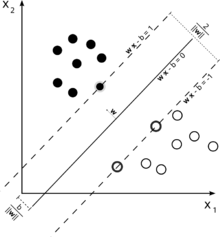 Ben-Hur, Asa, Horn, David, Siegelmann, Hava, and Vapnik, Vladimir; "Support vector clustering" (2001) Journal of Machine Learning Research, 2: 125–137. Karatzoglou, Alexandros et al. ; Support Vector Machines in R, Journal of Statistical Software April 2006, Volume 15, Issue 9.